Collective intelligence is shared or group intelligence that emerges from the collaboration, collective efforts, and competition of many individuals and appears in consensus decision making. The term appears in sociobiology, political science and in context of mass peer review and crowdsourcing applications. It may involve consensus, social capital and formalisms such as voting systems, social media and other means of quantifying mass activity. Collective IQ is a measure of collective intelligence, although it is often used interchangeably with the term collective intelligence. Collective intelligence has also been attributed to bacteria and animals. It can be understood as an emergent property from the synergies among: 1) data-information-knowledge; 2) software-hardware; and 3) experts (those with new insights as well as recognized authorities) that continually learns from feedback to produce just-in-time knowledge for better decisions than these three elements acting alone. Or more narrowly as an emergent property between people and ways of processing information. This notion of collective intelligence is referred to as Symbiotic intelligence by Norman Lee Johnson. The concept is used in sociology, business, computer science and mass communications: it also appears in science fiction. Pierre Lévy defines collective intelligence as, "It is a form of universally distributed intelligence, constantly enhanced, coordinated in real time, and resulting in the effective mobilization of skills. I'll add the following indispensable characteristic to this definition: The basis and goal of collective intelligence is mutual recognition and enrichment of individuals rather than the cult of fetishized or hypostatized communities." According to researchers Pierre Lévy and Derrick de Kerckhove, it refers to capacity of networked ICTs (Information communication technologies) to enhance the collective pool of social knowledge by simultaneously expanding the extent of human interactions. Similar to the g factor for general individual intelligence, a new scientific understanding of collective intelligence aims to extract a general collective intelligence factor c factor for groups indicating a group's ability to perform a wide range of tasks. Definition, operationalization and statistical methods are derived from g. Similarly as g is highly interrelated with the concept of IQ, this measurement of collective intelligence can be interpreted as intelligence quotient for groups (Group-IQ) even though the score is not a quotient per se. Causes for c and predictive validity are investigated as well. Writers who have influenced the idea of collective intelligence include Douglas Hofstadter (1979), Peter Russell (1983), Tom Atlee (1993), Pierre Lévy (1994), Howard Bloom (1995), Francis Heylighen (1995), Douglas Engelbart, Cliff Joslyn, Ron Dembo, Gottfried Mayer-Kress (2003). In 1912 Émile Durkheim identified society as the sole source of human logical thought. He argued, in "The Elementary Forms of Religious Life" that society constitutes a higher intelligence because it transcends the individual over space and time. Other antecedents are Vladimir Vernadsky's concept of "noosphere" and H.G. Wells's concept of "world brain" (see also the term "global brain"). Peter Russell, Elisabet Sahtouris, and Barbara Marx Hubbard (originator of the term "conscious evolution") are inspired by the visions of a noosphere – a transcendent, rapidly evolving collective intelligence – an informational cortex of the planet. The notion has more recently been examined by the philosopher Pierre Lévy. In a 1962 research report, Douglas Engelbart linked collective intelligence to organizational effectiveness, and predicted that pro-actively 'augmenting human intellect' would yield a multiplier effect in group problem solving: "Three people working together in this augmented mode [would] seem to be more than three times as effective in solving a complex problem as is one augmented person working alone". In 1994, he coined the term 'collective IQ' as a measure of collective intelligence, to focus attention on the opportunity to significantly raise collective IQ in business and society. Howard Bloom has discussed mass behavior—collective behavior from the level of quarks to the level of bacterial, plant, animal, and human societies. He stresses the biological adaptations that have turned most of this earth's living beings into components of what he calls "a learning machine". In 1986 Bloom combined the concepts of apoptosis, parallel distributed processing, group selection, and the superorganism to produce a theory of how collective intelligence works. Later he showed how the collective intelligences of competing bacterial colonies and human societies can be explained in terms of computer-generated "complex adaptive systems" and the "genetic algorithms", concepts pioneered by John Holland. Tom Atlee focuses primarily on humans and on work to upgrade what Howard Bloom calls "the group IQ". Atlee feels that collective intelligence can be encouraged "to overcome 'groupthink' and individual cognitive bias in order to allow a collective to cooperate on one process—while achieving enhanced intellectual performance." George Pór defined the collective intelligence phenomenon as "the capacity of human communities to evolve towards higher order complexity and harmony, through such innovation mechanisms as differentiation and integration, competition and collaboration." Atlee and Pór state that "collective intelligence also involves achieving a single focus of attention and standard of metrics which provide an appropriate threshold of action". Their approach is rooted in scientific community metaphor. The Global Futures Collective Intelligence System (GFIS) was created by The Millennium Project in 2012. Military united, trade unions, and corporations satisfy some definitions of CI – the most rigorous definition would require a capacity to respond to very arbitrary conditions without orders or guidance from "law" or "customers" to constrain actions.Online advertising companies are using collective intelligence to bypass traditional marketing and creative agencies. The UNU platform for "human swarming" (or "social swarming") establishes real-time closed-loop systems around groups of networked users molded after biological swarms, enabling human participants to behave as a unified collective intelligence. When connected to UNU, groups of distributed users collectively answer questions and make predictions in real-time. 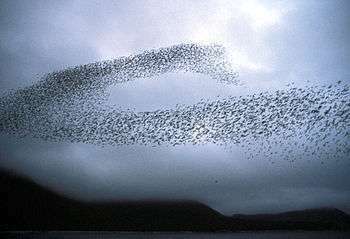 Early testing shows that human swarms can out-predict individuals. In 2016, an UNU swarm was challenged by a reporter to predict the winners of the Kentucky Derby, and successfully picked the first four horses, in order, beating 540 to 1 odds. Improvisational actors also experience a type of collective intelligence which they term 'Group Mind'. A further example of collective intelligence is found in idea competitions. Specialized information site such as Digital Photography Review or Camera Labs is an example of collective intelligence. Anyone who has an access to the internet can contribute to distributing their knowledge over the world through the specialized information sites. In this model, beings and information are modeled as abstract information molecules carrying expressions of mathematical logic. They are quasi-randomly displacing due to their interaction with their environments with their intended displacements. Their interaction in abstract computational space creates multi-thread inference process which we perceive as collective intelligence. Thus, a non-Turing model of computation is used. This theory allows simple formal definition of collective intelligence as the property of social structure and seems to be working well for a wide spectrum of beings, from bacterial colonies up to human social structures. Collective intelligence considered as a specific computational process is providing a straightforward explanation of several social phenomena. For this model of collective intelligence, the formal definition of IQS (IQ Social) was proposed and was defined as "the probability function over the time and domain of N-element inferences which are reflecting inference activity of the social structure." While IQS seems to be computationally hard, modeling of social structure in terms of a computational process as described above gives a chance for approximation. Prospective applications are optimization of companies through the maximization of their IQS, and the analysis of drug resistance against collective intelligence of bacterial colonies. Another approach of measuring collective intelligence, not directly related to the field of artificial intelligence, is the collective intelligence factor c.
Besides, this scientific idea also aims to explore the causes affecting collective intelligence, such as group size, collaboration tools or group members' interpersonal skills. The MIT Center for Collective Intelligence, for instance, announced the detection of 'The Genome of Collective Intelligence' as one of its main goals aiming to develop a taxonomy of organizational building blocks, or genes, that can be combined and recombined to harness the intelligence of crowds. Woolley, Chabris, Pentland, Hashmi, & Malone (2010), the originators of this scientific understanding of collective intelligence, found a single statistical factor for collective intelligence in their research across 192 groups with people randomly recruited from the public. In Woolley et al. 's two initial studies, groups worked together on different tasks from the McGrath Task Circumplex, a well-established taxonomy of group tasks. Tasks were chosen from all four quadrants of the circumplex and included visual puzzles, brainstorming, making collective moral judgments, and negotiating over limited resources. The results in these tasks were taken to conduct a factor analysis. Both studies showed support for a general collective intelligence factor c underlying differences in group performance with an initial eigenvalue accounting for 43% (44% in study 2) of the variance, whereas the next factor accounted for only 18% (20%). That fits the range normally found in research regarding a general individual intelligence factor g typically accounting for 40% to 50% percent of between-individual performance differences on cognitive tests. 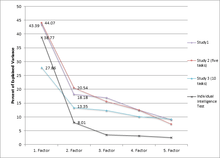 Afterwards, a more complex criterion task was absolved by each group measuring whether the extracted c factor had predictive power for performance outside the original task batteries. Criterion tasks were playing checkers (draughts) against a standardized computer in the first and a complex architectural design task in the second study. In a regression analysis using both individual intelligence of group members and c to predict performance on the criterion tasks, c had a significant effect, but average and maximum individual intelligence had not. While average (r=0.15, P=0.04) and maximum intelligence (r=0.19, P=0.008) of individual group members were moderately correlated with c, c was still a much better predictor of the criterion tasks. According to Woolley et al., this supports the existence of a collective intelligence factor c, because it demonstrates an effect over and beyond group members' individual intelligence and thus that c is more than just the aggregation of the individual IQs or the influence of the group member with the highest IQ. Bottom-up processes include characteristics of group members which are aggregated to the team level encompassing, for example, the average social sensitivity or the average and maximum intelligence scores of group members. Furthermore, collective intelligence was found to be related to a group's cognitive diversity including thinking styles and perspectives. Groups that are moderately diverse in cognitive style have higher collective intelligence than those who are very similar in cognitive style or very different. Consequently, groups where members are too similar to each other lack the variety of perspectives and skills needed to perform well. On the other hand, groups whose members are too different seem to have difficulties to communicate and coordinate effectively. Top-down processes cover, for example, conversational turn-taking. Research further suggest that collectively intelligent groups communicate more in general as well as more equally; same applies for participation and is shown for face-to-face as well as online groups communicating only via writing. Francis Heylighen, Valentin Turchin, and Gottfried Mayer-Kress are among those who view collective intelligence through the lens of computer science and cybernetics. In their view, the Internet enables collective intelligence at the widest, planetary scale, thus facilitating the emergence of a Global brain. The developer of the World Wide Web, Tim Berners-Lee, aimed to promote sharing and publishing of information globally. Later his employer opened up the technology for free use. In the early '90s, the Internet's potential was still untapped, until the mid-1990s when 'critical mass', as termed by the head of the Advanced Research Project Agency (ARPA), Dr. J.C.R. Licklider, demanded more accessibility and utility. The driving force of this Internet-based collective intelligence is the digitization of information and communication. Henry Jenkins, a key theorist of new media and media convergence draws on the theory that collective intelligence can be attributed to media convergence and participatory culture (Flew 2008). He criticizes contemporary education for failing to incorporate online trends of collective problem solving into the classroom, stating "whereas a collective intelligence community encourages ownership of work as a group, schools grade individuals". Jenkins argues that interaction within a knowledge community builds vital skills for young people, and teamwork through collective intelligence communities contribute to the development of such skills. Collective intelligence is not merely a quantitative contribution of information from all cultures, it is also qualitative. In this context collective intelligence is often confused with shared knowledge. The former is the sum total of information held individually by members of a community while the latter is information that is believed to be true and known by all members of the community. Collective intelligence as represented by Web 2.0 has less user engagement than collaborative intelligence. An art project using Web 2.0 platforms is "Shared Galaxy", an experiment developed by an anonymous artist to create a collective identity that shows up as one person on several platforms like MySpace, Facebook, YouTube and Second Life. The password is written in the profiles and the accounts named "Shared Galaxy" are open to be used by anyone. In this way many take part in being one. Another art project using collective intelligence to produce artistic work is Curatron, where a large group of artists together decides on a smaller group that they think would make a good collaborative group. The process is used based on an algorithm computing the collective preferences In creating what he calls 'CI-Art', Nova Scotia based artist Mathew Aldred follows Pierry Levy's definition of collective intelligence. Aldred's CI-Art event in March 2016 involved over four hundred people from the community of Oxford, Nova Scotia, and internationally. Later work developed by Aldred used the UNU swarm intelligence system to create digital drawings and paintings. The Oxford Riverside Gallery (Nova Scotia) held a public CI-Art event in May 2016, which connected with online participants internationally. Growth of the Internet and mobile telecom has also produced "swarming" or "rendezvous" events that enable meetings or even dates on demand. The full impact has yet to be felt but the anti-globalization movement, for example, relies heavily on e-mail, cell phones, pagers, SMS and other means of organizing. The Indymedia organization does this in a more journalistic way. Such resources could combine into a form of collective intelligence accountable only to the current participants yet with some strong moral or linguistic guidance from generations of contributors – or even take on a more obviously democratic form to advance shared goals. Games such as The Sims Series, and Second Life are designed to be non-linear and to depend on collective intelligence for expansion. This way of sharing is gradually evolving and influencing the mindset of the current and future generations. For them, collective intelligence has become a norm. In Terry Flew's discussion of 'interactivity' in the online games environment, the ongoing interactive dialogue between users and game developers, he refers to Pierre Levy's concept of Collective Intelligence (Levy 1998) and argues this is active in videogames as clans or guilds in MMORPG constantly work to achieve goals. Henry Jenkins proposes that the participatory cultures emerging between games producers, media companies, and the end-users mark a fundamental shift in the nature of media production and consumption. Jenkins argues that this new participatory culture arises at the intersection of three broad new media trends. Firstly, the development of new media tools/technologies enabling the creation of content. Secondly, the rise of subcultures promoting such creations, and lastly, the growth of value adding media conglomerates, which foster image, idea and narrative flow. Cultural theorist and online community developer, John Banks considered the contribution of online fan communities in the creation of the Trainz product. He argued that its commercial success was fundamentally dependent upon "the formation and growth of an active and vibrant online fan community that would both actively promote the product and create content- extensions and additions to the game software". Firms can create a new market for complementary goods by engaging in open source community. ↑ Ngoc Thanh Nguyen (25 July 2011). Transactions on Computational Collective Intelligence III. Springer. p. 63. ISBN 978-3-642-19967-7. Retrieved 11 June 2013. ↑ Ngoc Thanh Nguyen (25 July 2011). Transactions on Computational Collective Intelligence III. Springer. p. 69. ISBN 978-3-642-19967-7. Retrieved 11 June 2013. 1 2 3 4 5 6 7 8 9 10 11 12 13 14 15 16 17 18 19 20 21 Woolley, Anita Williams; Chabris, Christopher F.; Pentland, Alex; Hashmi, Nada; Malone, Thomas W. (2010-10-29). "Evidence for a Collective Intelligence Factor in the Performance of Human Groups". Science. 330 (6004): 686–688. doi:10.1126/science.1193147. ISSN 0036-8075. PMID 20929725. 1 2 Jensen, Arthur, R. (1992). "Understanding g in terms of information processing". Educational Psychology Review. 4: 271–308. doi:10.1007/bf01417874. ↑ Waldron, Jeremy (1995). "The Wisdom of the Multitude: Some Reflections on Book 3, Chapter 11 of Aristotle's Politics". Political Theory. 23 (4): 563–584;. doi:10.1177/0090591795023004001. ↑ Cammack, Daniela (2013). "Aristotle and the Virtue of the Multitude". Political Theory. 41: 175–202. doi:10.1177/0090591712470423. ↑ "About the Book - Foundation for Conscious Evolution". Foundation for Conscious Evolution. Retrieved 2016-12-04. ↑ Leimeister, Jan Marco (2010-06-24). "Collective Intelligence". Business & Information Systems Engineering. 2 (4): 245–248. doi:10.1007/s12599-010-0114-8. ISSN 1867-0202. ↑ Lee,Sang M.,et al. "Success factors of platform leadership in web 2.0 service business." Service Business 4.2 (2010): 89-103. ↑ Spearman, Charles, E. (1904). ""General intelligence," objectively determined and measured". American Journal of Psychology. 15: 201–293. doi:10.2307/1412107. 1 2 3 4 5 6 Engel, D.; Woolley, A. W.; Jing, L. X.; Chabris, C. F. & Malone, T. W. (2014). "Reading the Mind in the Eyes or reading between the lines? Theory of Mind predicts collective intelligence equally well online and face-to-face". PLOS ONE. 9 (12): e115212. doi:10.1371/journal.pone.0115212. ↑ van der Maas, Han L. J.; Dolan, Conor V.; Grasman, Raoul P. P. P.; Wicherts, Jelte M.; Huizenga, Hilde M.; Raijmakers, Maartje E. J. (2006-10-01). "A dynamical model of general intelligence: the positive manifold of intelligence by mutualism". Psychological Review. 113 (4): 842–861. doi:10.1037/0033-295X.113.4.842. ISSN 0033-295X. PMID 17014305. ↑ McCrae, R. R.; Costa Jr., P. T. (1987). "Validation of the Five-Factor Model of Personality Across Instruments and Observers" (PDF). Journal of Personality and Social Psychology. 52 (1): 81–90. doi:10.1037/0022-3514.52.1.81. ↑ Briley, Daniel A.; Tucker-Drob, Elliot M. (2014-09-01). "Genetic and environmental continuity in personality development: a meta-analysis". Psychological Bulletin. 140 (5): 1303–1331. doi:10.1037/a0037091. ISSN 1939-1455. PMC 4152379 . PMID 24956122. ↑ Deary, Ian J.; Spinath, Frank M.; Bates, Timothy C. (2006-01-01). "Genetics of intelligence". European Journal of Human Genetics. 14 (6): 690–700. doi:10.1038/sj.ejhg.5201588. ISSN 1018-4813. 1 2 3 4 5 Baron-Cohen S, Wheelwright S, Hill J, Raste Y, Plumb I (2001). "The Reading the Mind in the Eyes Test revised version: a study with normal adults, and adults with Asperger syndrome or high-functioning autism". Journal of Child Psychology and Psychiatry. 42: 241–251. doi:10.1017/s0021963001006643. ↑ Apperly, Ian A. (2012-05-01). "What is "theory of mind"? Concepts, cognitive processes and individual differences". The Quarterly Journal of Experimental Psychology. 65 (5): 825–839. doi:10.1080/17470218.2012.676055. ISSN 1747-0218. PMID 22533318. ↑ Flavell, J. H. (1999-01-01). "Cognitive development: children's knowledge about the mind". Annual Review of Psychology. 50: 21–45. doi:10.1146/annurev.psych.50.1.21. ISSN 0066-4308. PMID 10074674. ↑ Premack, David; Woodruff, Guy (1978-12-01). "Does the chimpanzee have a theory of mind?". Behavioral and Brain Sciences. 1 (04): 515–526. doi:10.1017/S0140525X00076512. ISSN 1469-1825. ↑ Heyes, Cecilia M.; Frith, Chris D. (2014-06-20). "The cultural evolution of mind reading". Science. 344 (6190): 1243091. doi:10.1126/science.1243091. ISSN 0036-8075. PMID 24948740. ↑ Hallerbäck, Maria Unenge; Lugnegård, Tove; Hjärthag, Fredrik; Gillberg, Christopher (2009-03-01). "The Reading the Mind in the Eyes Test: Test–retest reliability of a Swedish version". Cognitive Neuropsychiatry. 14 (2): 127–143. doi:10.1080/13546800902901518. ISSN 1354-6805. PMID 19370436. ↑ Pinkham, Amy E.; Penn, David L.; Green, Michael F.; Buck, Benjamin; Healey, Kristin; Harvey, Philip D. (2014-07-01). "The Social Cognition Psychometric Evaluation Study: Results of the Expert Survey and RAND Panel". Schizophrenia Bulletin. 40 (4): 813–823. doi:10.1093/schbul/sbt081. ISSN 0586-7614. PMC 4059426 . PMID 23728248. 1 2 Yip, Jeremy A.; Côté, Stéphane (2013-01-01). "The Emotionally Intelligent Decision Maker Emotion-Understanding Ability Reduces the Effect of Incidental Anxiety on Risk Taking". Psychological Science. 24 (1): 48–55. doi:10.1177/0956797612450031. ISSN 0956-7976. PMID 23221020. 1 2 3 4 Aggarwal, I. & Woolley, A.W. (2014). "The effects of cognitive diversity on collective intelligence and team learning.". Symposium presented at the 50th Meeting of the Society of Experimental Social Psychology, Columbus, OH. 1 2 3 Engel, D.; Woolley, A. W.; Aggarwal, I.; Chabris, C. F.; Takahashi, M.; Nemoto, K.; Malone, T. W. (2015). "Collective intelligence in computer-mediates collaboration emerges in different contexts and cultures.". In Proceedings of the 33rd Annual ACM Conference on Human Factors in Computing Systems (CHI '15) (pp. 3769–3778). New York, NY: ACM. ↑ "Collective Intelligence 2012". arxiv.org. Retrieved 2016-04-27. 1 2 3 4 5 6 Woolley, Anita Williams; Aggarwal, Ishani; Malone, Thomas W. (2015-12-01). "Collective Intelligence and Group Performance". Current Directions in Psychological Science. 24 (6): 420–424. doi:10.1177/0963721415599543. ISSN 0963-7214. 1 2 3 Aggarwal, I.; Woolley, A. W.; Chabris, C. F. & Malone, T. W. (2015). "Cognitive diversity, collective intelligence, and learning in teams.". Paper presented at the 2015 Collective Intelligence Conference, Santa Clara, CA. ↑ Kozhevnikov, M.; Evans, C. & Kosslyn, S. M. (2014). "Cognitive style as environmentally sensitive individual differences in cognition: A modern synthesis and applications in education, business, and management". Psychological Science in the Public Interest. 15: 3–33. doi:10.1177/1529100614525555. ↑ Schmidt, F.L. & Hunter, J.E. (1998). "The validity and utility of selection methods in personnel psychology: Practical and theoretical implications of 85 years of research findings". Psychological Bulletin. 124: 262–274. doi:10.1037/0033-2909.124.2.262. ↑ Nathan, B. (1997). "Intelligence, Schooling, and Society". American Psychologist. 52 (10): 1046–1050. 1 2 Deary, I.J. ; Weiss, A. & Batty, D.G. (2010). "Intelligence and Personality as Predictors of Illness and Death. How Researchers in Differential Psychology and Chronic Disease Epidemiology Are Collaborating to Understand and Address Health Inequalities". Psychological Science in the Public Interest. 11 (2): 53–79. doi:10.1177/1529100610387081. ↑ Hedden, Trey; Gabrieli, John D. E. (2004-02-01). "Insights into the ageing mind: a view from cognitive neuroscience". Nature Reviews. Neuroscience. 5 (2): 87–96. doi:10.1038/nrn1323. ISSN 1471-003X. PMID 14735112. 1 2 Shipstead, Zach; Redick, Thomas S; Engle, Randall W. (2010-10-01). "Does working memory training generalize?". Psychologica Belgica. 50 (3-4): 245. doi:10.5334/pb-50-3-4-245. ISSN 2054-670X. ↑ Kidd, David Comer; Castano, Emanuele (2013-10-18). "Reading Literary Fiction Improves Theory of Mind". Science. 342 (6156): 377–380. doi:10.1126/science.1239918. ISSN 0036-8075. PMID 24091705. ↑ Black, Jessica; Barnes, Jennifer L. "Fiction and social cognition: The effect of viewing award-winning television dramas on theory of mind.". Psychology of Aesthetics, Creativity, and the Arts. 9 (4): 423–429. doi:10.1037/aca0000031. ↑ LePine, Jeffery A. "Adaptation of Teams in Response to Unforeseen Change: Effects of Goal Difficulty and Team Composition in Terms of Cognitive Ability and Goal Orientation.". Journal of Applied Psychology. 90 (6): 1153–1167. doi:10.1037/0021-9010.90.6.1153. ↑ Tziner, Aharon; Eden, Dov. "Effects of crew composition on crew performance: Does the whole equal the sum of its parts?". Journal of Applied Psychology. 70 (1): 85–93. doi:10.1037/0021-9010.70.1.85. ↑ Devine, Dennis J.; Philips, Jennifer L. (2001-10-01). "Do Smarter Teams Do Better A Meta-Analysis of Cognitive Ability and Team Performance". Small Group Research. 32 (5): 507–532. doi:10.1177/104649640103200501. ISSN 1046-4964. ↑ Evans, Charles R.; Dion, Kenneth L. (1991-05-01). "Group Cohesion and Performance A Meta-Analysis". Small Group Research. 22 (2): 175–186. doi:10.1177/1046496491222002. ISSN 1046-4964. ↑ Gully, Stanley M.; Devine, Dennis J.; Whitney, David J. (2012-12-01). "A Meta-Analysis of Cohesion and Performance Effects of Level of Analysis and Task Interdependence". Small Group Research. 43 (6): 702–725. doi:10.1177/1046496412468069. ISSN 1046-4964. ↑ Beal, Daniel J.; Cohen, Robin R.; Burke, Michael J.; McLendon, Christy L. "Cohesion and Performance in Groups: A Meta-Analytic Clarification of Construct Relations.". Journal of Applied Psychology. 88 (6): 989–1004. doi:10.1037/0021-9010.88.6.989. ↑ O'leary-kelly, Anne M.; Martocchio, Joseph J.; Frink, Dwight D. (1994-10-01). "A Review of the Influence of Group Goals on Group Performance". Academy of Management Journal. 37 (5): 1285–1301. doi:10.2307/256673. ISSN 0001-4273. ↑ Kleingeld, Ad; Mierlo, Heleen van; Arends, Lidia. "The effect of goal setting on group performance: A meta-analysis.". Journal of Applied Psychology. 96 (6): 1289–1304. doi:10.1037/a0024315. ↑ Duffy, M. K.; Shaw, J. D. & Stark, E. M. (2000). "Performance and satisfaction in conflicted interdependent groups: When and how does selfesteem make a difference?". Academy of Management Journal. 43: 772–782. doi:10.2307/1556367. ↑ Library, World Public. "| World Public Library - eBooks | Read eBooks online". www.worldlibrary.org. Retrieved 2016-12-04. ↑ MIT Center for Collective Intelligence. Cci.mit.edu. Retrieved on 2013-07-13. ↑ Scardamalia, Marlene; Bereiter, Carl (1994-07-01). "Computer Support for Knowledge-Building Communities". Journal of the Learning Sciences. 3 (3): 265–283. doi:10.1207/s15327809jls0303_3. ISSN 1050-8406. ↑ Fu, Wai-Tat (2010). "Semantic imitation in social tagging". ACM Transactions on Computer-Human Interaction. doi:10.1145/1460563.1460600. ↑ Fu, Wai-Tat (Aug 2009). "A Semantic Imitation Model of Social Tagging.". Proceedings of the IEEE conference on Social Computing: 66–72. ↑ Flew, Terry and Humphreys, Sal (2005) "Games: Technology, Industry, Culture" in Terry Flew, New Media: An Introduction (2nd edn), Oxford University Press, South Melbourne 101-114. ↑ Henry Jenkins (2002) in Flew, Terry and Humphreys, Sal (2005) Games: Technology, Industry, Culture in Terry Flew, New Media: An Introduction (2nd edn), Oxford University Press, South Melbourne 101-114. ↑ Gosney, J.W, 2005, Beyond Reality: A Guide to Alternate Reality Gaming, Thomson Course Technology, Boston. ↑ Ma, Ying; Li, Guanyi; Dong, Yingsai; Qin, Zengchang (2010). "Minority Game Data Mining for Stock Market Predictions" (PDF). Agents and Data Mining Interaction, 6th International Workshopon Agents and Data Mining Interaction, ADMI 2010. doi:10.1007/978-3-642-15420-1. ↑ Yu, Du; Dong, Yingsai; Qin, Zengchang; Wan, Tao (2011). "Exploring Market Behaviors with Evolutionary Mixed-Games Learning Model" (PDF). Computational Collective Intelligence. Technologies and Applications – Third International Conference, ICCCI 2011: 244–253. doi:10.1007/978-3-642-23935-9_24. ↑ Fama, E.F. (1970). "Efficient Capital Markets: A Review of Theory and Empirical Work". Journal of Finance. 25 (2): 383–417. doi:10.2307/2325486. ↑ Jensen, M.C (1967). "The Performance of Mutual Funds in the Period 1945–1964". Journal of Finance. 23 (2): 389–416. doi:10.1111/j.1540-6261.1968.tb00815.x. Fadul, Jose A. (2009). "Collective Learning: Applying Distributed Cognition for Collective Intelligence". The International Journal of Learning. Common Ground. 16 (4): 211–220. doi:10.18848/1447-9494/cgp/v16i04/46223. ISSN 1447-9494.